Acorn collection for 2018 has now closed! Each fall GOMPS issues a call for volunteer acorn collectors! The need for local acorns is great as we strive to keep our nursery up and running. Volunteers are needed to collect acorns in all regions of Greater Victoria and we have written helpful guidelines that include tips on collection, sorting and testing as well as labeling and storage. When you have collected enough acorns they can be delivered to two central locations in Saanich for cold storage. We request that collectors try to limit the volume of acorns from any one area to between 4 - 8 liters. Our reason is that we hope to encourage collecting from a wider variety of sources throughout our entire region. If you collect acorns in an ice cream pail or household/utility bucket you will have a quick gauge of approximate volume. After collecting please be sure to sort and float test your acorns to ensure only the most viable and healthy nuts are collected. This stage is vital to ensuring a healthy, pest free crop and provides an educational opportunity for all ages of students. Please note: We are only calling for acorns - if you have seedlings to donate please read our GOMPS Seedling Donation Policy. Follow Mt. Douglas Cross Road to Livingstone Avenue, turn left on Beam Crescent and then right on Eric Road. Acorns may be dropped on left side of house near garage – look for a specially marked large white pail/bucket. Follow Burnside Road West to Biscoe Drive then turn right onto Jones Terrace. Acorns may be dropped in garage – look for a specially marked Rubbermaid style container. ​The image on the left links to a poster you can download to help spread the word. Share it with your school, your Girl Guide or Boy Scout group, or anyone in your neighbourhood. 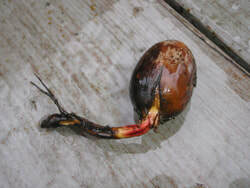 We need acorns from Sidney, Oak Bay, Saanich, Victoria, Langford, Sooke and anywhere else you can find one growing! Tell your teacher, tell your aunt Jenny and even your cousins. Are all the oaks I see in BC Garry oaks? In short, no - but knowing what to look for can help to keep the task of acorns collecting simple. Click on the thumbnail image at left and it will open A Guide to Identifying the Garry Oak. 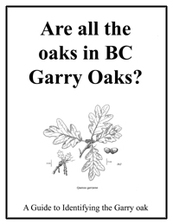 Garry oaks are the only oak native in British Columbia and their range is very small. They are most commonly found on Southern Vancouver Island, the Gulf Islands and in a few places near Hope, BC. That said they may also be found in other places. Recent efforts to map the remaining habitats of Garry Oak have found them in the Comox Valley of Central Vancouver Island. While it is unlikely to find a grove of Garry oaks growing outside their native range you may see a specimen on the boulevard or in a local park (such as in Queen Elisabeth Park, Vancouver, BC http://vancouver.ca/parks-recreation-culture/queen-elizabeth-park.aspx). To assist you in correctly identifying the Garry oak we have extracted this information from Volume 3 of the Illustrated Flora of British Columbia. This botany reference book, from the Research Branch of the BC Government's Ministry of Forests, Lands and Natural Resource Operations, is part of an eight volume series available at your local library or for purchase through the Queen's Printer of BC http://www.for.gov.bc.ca/hfd/pubs/docs/Mr/MR_IllustratedFlora.htm. Our extract provides you with illustrations and keys to the Garry oak and the English oak - probably the two most common oaks in BC. You can search the Internet for more information but some other useful links are The Tree Book from the BC Forest Service and E-Flora BC: an Electronic Atlas from UBC.